It wouldn’t be accurate to say that Tana French writes the traditional “Whodunit?” crime thriller because it’s almost always clear which character committed the murder. The mystery is more about how the Dublin Murder Squad puts the pieces together and closes out the case. Readers are alongside the detectives at every step. 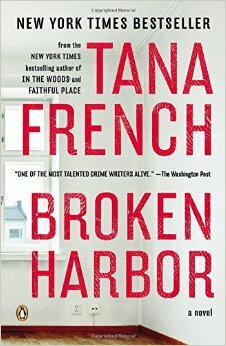 Broken Harbor begins with the murder of a family of four – well, nearly. The mother barely survives as her body is found in the last stages of its life. Detective “Scorcher” Kennedy is all too familiar with the neighborhood where the Spain family lives. It was one of those up-and-coming, pop-up communities where all the houses look similar and there are promises of playgrounds and swimming pools. Yet the builders were scammers and the Spain’s neighborhood was left half-built and mostly empty. Inside their own house, animal traps, half a dozen baby monitors, and holes in the walls make the case even more curious. But what does that have to do with the murder of Pat Spain, his two children, and the near-death of his wife, Jenny? Richie, Scorcher’s rookie partner, brings balance to their investigation with a set of fresh eyes. Plus, they both have their own demons to contend with, childhood memories and hauntings that shape the way they consider suspects. The story unfolds slowly and carefully. A little more than halfway through the book I figured out who the murderer was, but I couldn’t figure out how the detectives would unpack all the clues and end up with a conviction. This is why Tana French is so good. She crafts a story so delicately that you have to wonder where she starts. Is it with the murder? The motive? Does she start at the end and work backward? Does she start with one character and build from there? Does it just flow out of her brain, like it took no effort at all? She’s good, y’all. I started The Secret Place yesterday and I’ve already got my sights on the villain.